Vision Interactive is a lightweight and rich-feature plugin helps you enhance images with additional information and links. With this plugin you are able to easily annotate images with text, shapes and icons, draw attention to areas and features on images. You can then use them in posts that empower publishers and bloggers to create more engaging content. 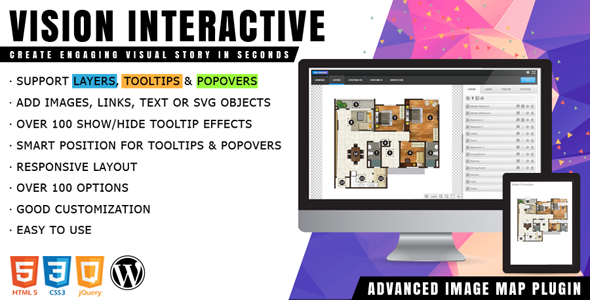 It provides an easy way for you to convert a static image into the online interactive media brochures or booklets, image maps, immersive storytelling in seconds. The plugin can be deployed easily and runs on all modern browsers and mobile devices.